For the first time ever, the cast and producers of FOX's "Bones" crossed the pond last month to shoot at an international location. The 2-hour September 3 season 4 premiere will be titled "The Yanks in the UK" and set in London. 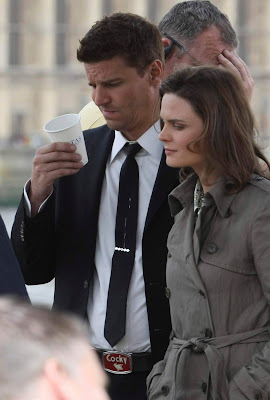 Partners Dr. Temperance Brennan (Emily Deschanel) and Special Agent Seeley Booth (David Boreanaz) make the trip from Washington, DC, to Britain where Brennan is guest-lecturing at Oxford University and Booth speaking at Scotland Yard. They are however asked by local officials to lend their expertise to a high-profile murder investigation involving a young British heiress. The girl was yanked from The Thames in her Range Rover. Filming began on Saturday, June 14. Shooting at various locations in and around London, including the Thames River, Oxford University and Canary Wharf will take several weeks. 'American Idol' Tour Kicks Off Tonight!